The Ohio State Highway Patrol has released aerial footage of the Powhatan Point well pad. 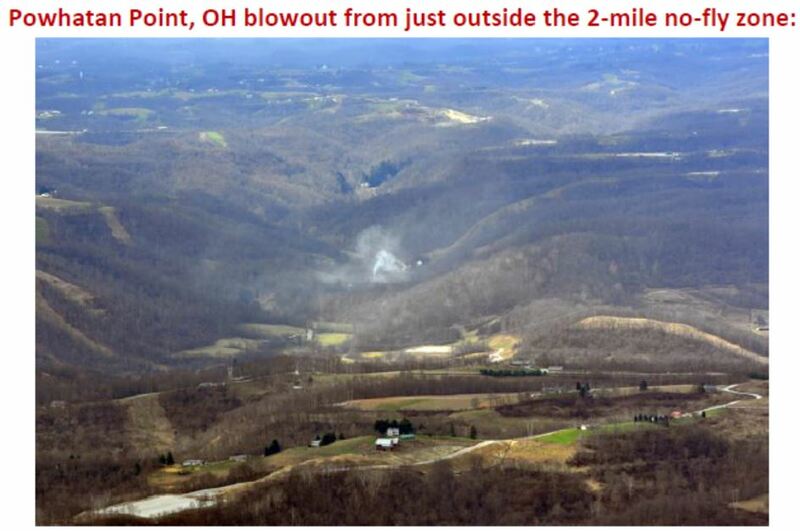 The helicopter video allowed disaster response units to conduct an aerial site assessment, and was critical to the panel of experts from XTO Energy, The Ohio Department of Natural Resources, the Environmental Protection Agency and others. On Feb. 15, calls with 911 reported a “gas well fire with explosion” on Cats Run Road. “I told my husband ‘This sounds like a swarm of bees’,” said resident Carol Matesick. Emergency response team members secured the location and began to notify residents inside the half-mile evacuation zone. “They came knocking on our doors and the fire department told us we had to evacuate,” said resident Chuck Passmore. XTO and the EPA began monitoring for explosive levels of gas near the pad and air quality downwind of the site. It was determined there was no health risk to the public outside of the containment area. The proximity to Cats Run Creek was a concern and localized flooding made the situation more difficult. There was also the possibility of contamination from potentially toxic well fluids and chemicals stored on site and used in the finalization process. A crane used in finalizing the well had fallen on an adjacent Clinton oil well, causing additional concern. “Immediately when the shut down, the shut down valve went on, so there is nothing flowing from those, but when the crane fell, it fell on one of those wells,” Matusic said. Once the weather broke, well control specialists began clearing equipment from around the site to provide better access. Seals and valves on adjacent wells were tested and extra valves were put in place to ensure no additional leaks. Then, word came on Wednesday: the well had been contained. “Our EMA Director Dave Ivan, who I mentioned earlier, has been giving us constant updates and he did just message Commissioner Meyer and I that the well had been contained,” said Belmont County Commissioner J.P. Dutton. The process took 20 days. 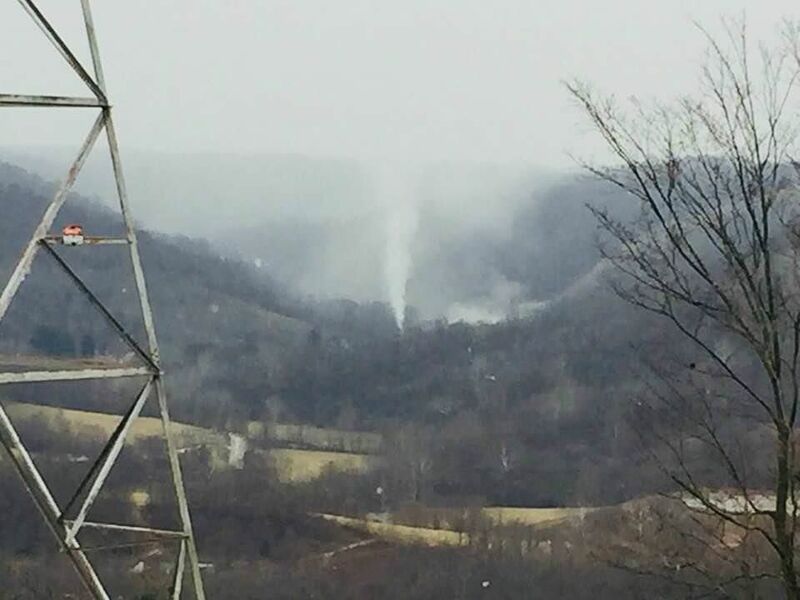 POWHATAN POINT — After delays caused by weather and the need to move heavy debris, XTO Energy took another step toward resolving a Feb. 15 well pad explosion by diverting and flaring the well’s natural gas stream Tuesday. Nearby residents heard a brief noise when the leaking natural gas stream, directed into a nearby excavated containment and burning area, was flared, XTO spokeswoman Karen Matusic. She noted the gas was expected to burn all night and said when the burning was completed, a safe working area should be prepared. “Diverting and flaring the natural gas flowing from the well will ensure that no natural gas remains in the area during containment operations. Current monitoring indicates low levels of natural gas on the well pad. These levels are within acceptable health levels, and controlled flaring of the natural gas stream will further allow workers to safely gain containment of the well,” she said. 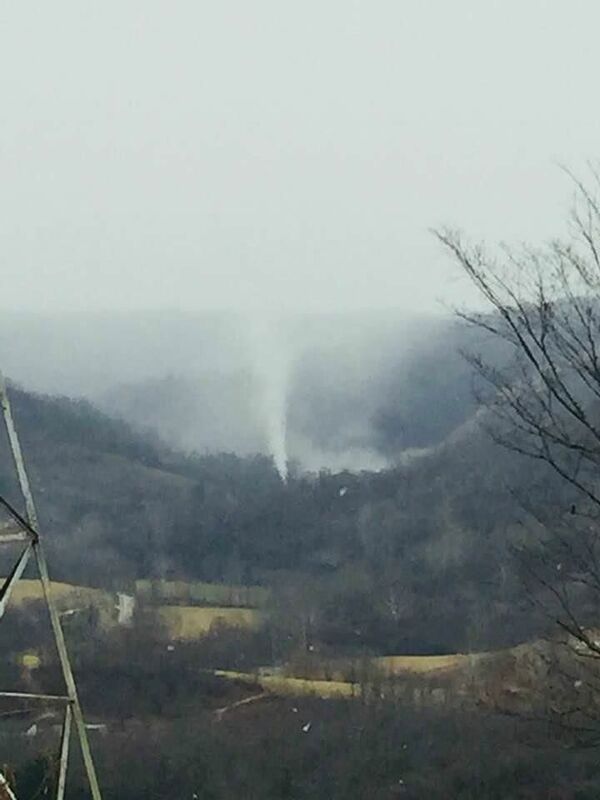 Light from the burning gas could be seen across much of Belmont County. A bright orange glow was spotted to the southeast from the area of Interstate 70 exit 208, near Union Local High School. In Belmont, that glow was accompanied by bright flashes that resembled lightning in the sky. Residents in Centerville and St. Clairsville also said they could see the flames from the flaring process. Matusic added that XTO Energy’s well control specialists were on hand Tuesday to complete the work while continuing well containment activities. She said air monitoring around the area continues without disruption, utilizing continuous fixed and mobile monitors. Air monitoring readings continue to show no public health or safety risks, [We forced families to leave their homes for three weeks, just because] Matusic said. She expects the well may be capped a few days after the burning is complete. 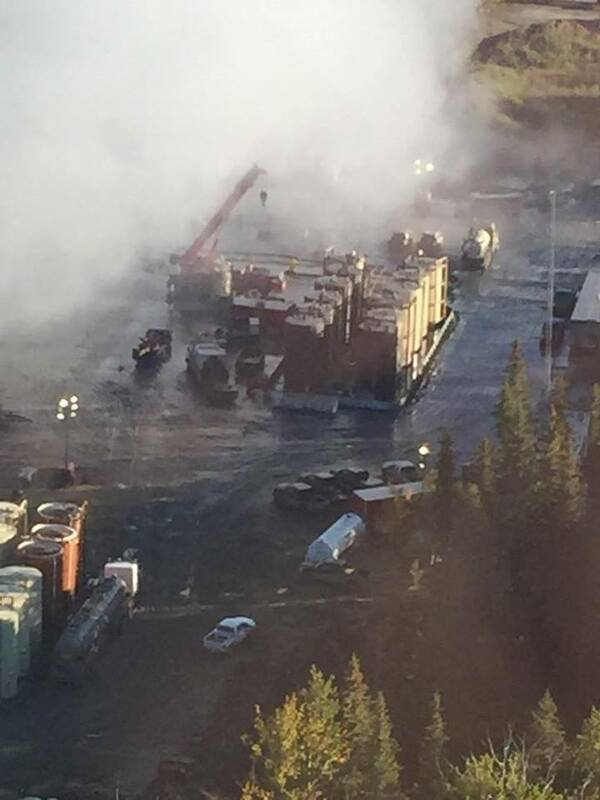 Matusic said that as of Friday, crews had cleared the debris of a large crane damaged in the explosion from the well pad, allowing better access to the affected area. XTO also has rented a heavy-duty temporary bridge and installed it over Cats Run Creek. Matusic said the bridge helps workers access the well site, allowing vehicles and crews to come and go more smoothly. In the aftermath of the February explosion, a total of 30 homes in a 1-mile radius of the pad were evacuated; those residents were housed in area hotels at XTOs expense. The exterior half-mile has since been cleared for residents to return, but four homes remain in the interior half-mile evacuation zone. Some evacuees have elected to remain away from home until the well is capped. Matusic said XTO has also covered residents’ losses of food and refrigerators due to a related power outage and has provided generators during flooding that resulted from heavy rain. Residents whose homes are in the evacuation zone are allowed to access their homes to feed livestock and tend to other business. Matusic said XTO is trying to keep the roads in the area of the Schnegg pad clear for the stream of traffic moving to and from the well site. POWHATAN POINT — XTO Energy today successfully capped a natural gas well that had been leaking since mid-February. Belmont County Commissioner J.P. Dutton announced the operation had been completed during today’s commission meeting. He received the news via text message from county Emergency Management Agency Director Dave Ivan. A Feb. 15 explosion at the XTO Schnegg pad along Cats Run led to the evacuation of about 100 residents in the area. Most of them had been allowed to return home, but some remained displaced while crews worked for weeks to access and cap the damaged wellhead. For more details, see Thursday’s edition of The Times Leader. 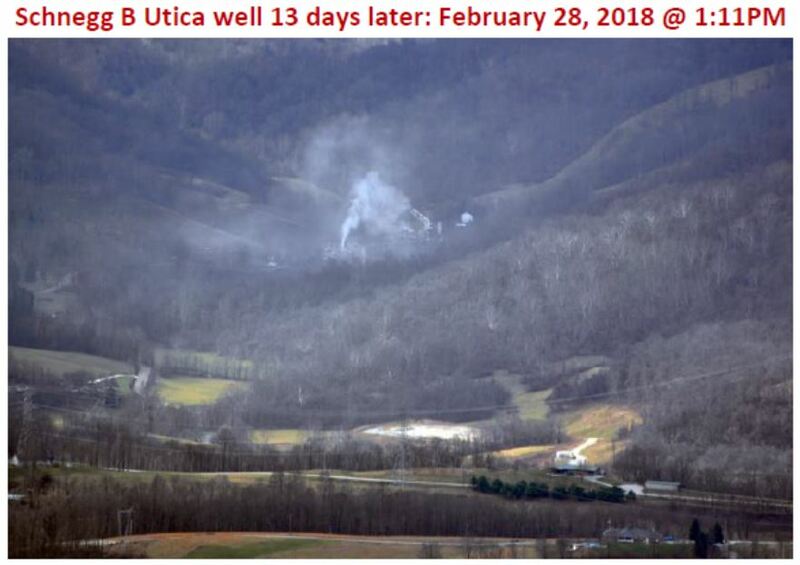 POWHATAN POINT, Ohio (WTRF) – According to XTO Energy officials, the well control team has successfully stopped the flow of the gas in the affected well shortly before 10 a.m. Wednesday. Families are returning home with the help of XTO Energy officials. AEP will be working to restore power supplies to the impacted homes in the area around the well. 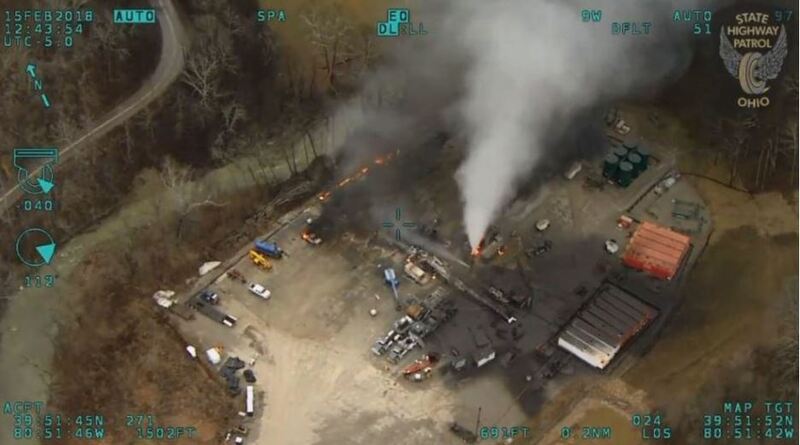 Captina Creek, Ohio — Today, Earthworks released new optical gas imaging video that exposes massive methane pollution at an exploded XTO oil and gas site in Belmont County, Ohio. The pollution has been rapidly spilling into the air un-contained since February 15, 2018. The video was captured as part of Earthworks’ Community Empowerment Project (CEP) as a result of a request from local community members who could see the explosion from their home two miles away. CEP helps protect communities and the climate by making visible normally invisible air pollution from oil and gas production, pressuring regulators and companies to reduce that pollution. In the past four years, CEP has documented and made publicly available over 500 incidents of oil and gas related air pollution in 16 states, Mexico and Canada. Following the explosion at the Schnegg pad, Exxon Mobil-owned XTO ordered an evacuation for 30 homes within a mile of the site. The outer half-mile has since been approved to return, but some have elected to stay clear until the well pad is capped. “Disasters like this are difficult to predict and to regulate. If we really want to keep our communities safe we need to keep oil and gas in the ground,” said Jennifer Krill, Earthworks’ Executive Director. A U.S. Environmental Protection Agency report estimates pollution from the still out-of-control site at 100 million cubic feet per day. This pollution includes methane, produced water, brine, unknown condensate components, and volatile organic compounds — all being released into the surrounding environment untreated and unfiltered. California’s Air Resources Board estimates that the Aliso Canyon disaster in Porter Ranch, California in 2015 released an average of 49 million cubic feet of methane daily for more than three months. Methane is 86 times worse for the climate than carbon dioxide over 20 years according to the Intergovernmental Panel on Climate Change (IPCC). 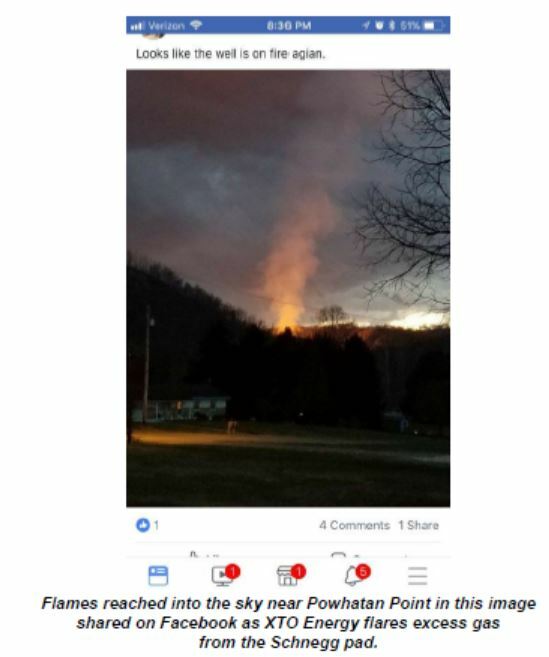 POWHATAN POINT, OHIO (WTRF) – If you saw a large ball of fire or a bright sky south of Moundsville Tuesday night, officials say there was nothing to worry about. This is all part of the final phases of the cleaning process following a well pad explosion at the XTO well pad that happened back on February 15. XTO officials told 7News the natural gas stream had been diverted into a nearby containment area where it was being flared. XTO warned that noises could be heard accompanying the large fire. Manager of Public and Government Affairs, Karen Matusic said they were being very careful and the flaring process was the safest way to cap the well. XTO had a fire truck at the site to ensure a prompt response should they have needed it along with keeping a crew there around the clock to monitor the situation. XTO claims office remained open and the company urged any local residents who may have been impacted to give them a call at 1-855-351-6573. 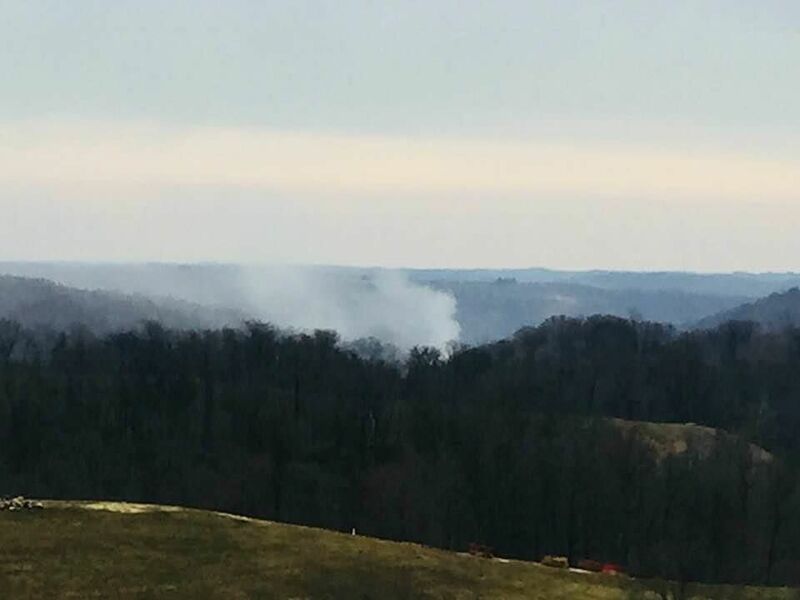 Belmont County – XTO Energy says they’re “coming down the home stretch,” repairing problems caused by that Feb. 15 well pad explosion in Powhatan. At this hour, workers are getting ready to go in and kill that well. XTO’s spokesperson says in order to do that, they’ll have to divert the gas first. “What we’re hoping to do this afternoon, weather permitting, is to divert the gas flow that’s coming from the well that had the loss of control incident, into what we call a burn pit,” explained Karen Matusic, XTO public affairs manager. Matusic says the gas will flare down into the burn pit that’s 50 feet high and 90 feet wide. She says the noise won’t be any louder than what people in the area are hearing now. She says hopefully the process will be completed within a few days. Why a 2 mile no fly zone if no safety risk? Carol Matesick is a lifelong resident and organist at the Amity United Methodist Church along State Route 148. 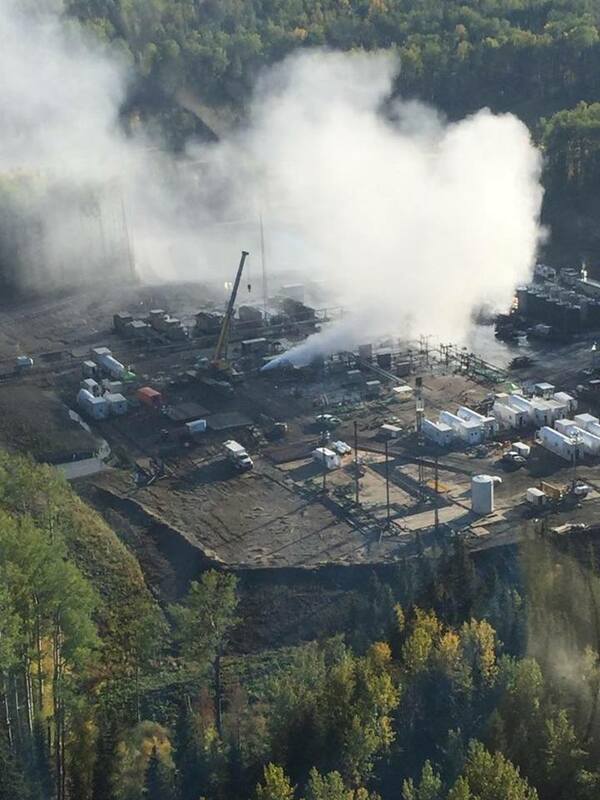 Well pad remediation continues for XTO Energy after a well pad explosion and fire two weeks ago. That means a handful of evacuated residents still cannot return home. This is day 14 of evacuation for residents within one-half mile of the affected well pad on Cat’s Run Road. Little did she and her husband, Milan, know that they would be taking up short-term residence at the church’s adjacent apartment following the evacuation order two weeks prior. Carol recalled the moment she knew something – on the run – was amiss. Minutes later, the Matesicks received a call. “The phone rang, and a man said that we were going to have to leave right away,” Carol said. The Matesicks are one of just four families who remain displaced in the ½-mile evacuation zone. The progress continues on Cat’s Run Road. XTO Energy’s well control team successfully removed the portion of the crane that fell on an adjacent wellhead and is staging the pad site for well containment work. A fully assembled bridge will be installed over Cat’s Run Creek to create an additional entrance and exit from the pad to enhance on-site worker safety during the well control process. Meanwhile, the Matesicks are hoping to return home as soon as possible. With rain and high winds in the forecast, the team continues to monitor weather conditions to ensure safe operations. The Belmont County Board of Commissioners gave an update on the state of the county in the recent emergency flooding and well pad explosion response at Powhatan Point during the Wednesday meeting. Commissioners commended Belmont County Emergency Management Director David Ivan and Assistant Director Becky Horn for the response during the emergencies. Commissioners J.P. Dutton and Josh Meyer seconded these commendations for the responders, as well as the response from XTO Energy. The explosion occurred Feb. 15 at XTO’s Schnegg pad near Captina Creek. XTO spokeswoman Karen Matusic said her company deeply regretted the evacuation that has required some residents to be outside of their homes since the time of the accident, which resulted in the evacuation of 30 homes in a mile radius of the site. More recently, the outer half-mile has been cleared for individuals to return, but some have elected to remain out of their homes until the well pad is capped. Four homes remain evacuated inside the inner half-mile. “We have been overwhelmed with the warm welcome. The understanding of the people,” Matusic said, thanking the residents for their patience. She added that access roads to the pad have been reinforced and a bridge that was delivered over the weekend is now fully assembled and ready to be installed over Cats Run Creek to create an additional entrance and exit from the pad site to enhance safety for onsite workers. In addition, a significant amount of damaged and unused equipment has been removed from the pad. A portion of the crane that was laying on the adjacent wellhead has been removed from that wellhead, with plans to remove the entire crane from the pad. Matusic said no gas has escaped from the second well and that it has been secured. “We need to get big equipment in and out of the area,” she said. Matusic added that fracking and drilling were not ongoing when the accident occurred. “It’s a very safe, regulated industry, but accidents happen,” Thomas said. According to XTO officials, XTO Energy’s well control team continues to remove equipment and debris from the well site in order to assure clear access to control the well. Expected rain will be monitored throughout the day to ensure safe operations. The air monitoring continues without disruption, and four homes remain in the half-mile evacuation zone. Again claims adjusters and XTO representatives are on site to help with the community’s needs, and can be reached by phone at (855) 351-6573. XTO Energy’s well control team continues working to control the well while monitoring weather conditions to ensure safe operations as rain is expected throughout the day, according to XTO Energy officials. Worker and residential safety remains a top priority, and the air monitoring continues without disruption. There are four homes that are still in the half-mile evacuation zone. The claims office remains open. and claims adjusters and XTO representatives are on site to assist with the community’s needs. Any local residents who may have been impacted by this incident are encouraged to call 855-351-6573 or visit XTO Energy’s community response command center at the Powhatan Point Volunteer Fire Department at 104 Mellott Street, Powhatan Point, OH, 43942. According to XTO Energy officials, current weather conditions have slowed operations to contain the well, but XTO Energy’s well control team is continuing to work to get the well under control. In these conditions, officials say that worker and residential safety remains a top priority. Four homes remain in the half-mile evacuation zone, and air monitoring will continue. Any local residents who may have been impacted by this incident are encouraged to call (855) 351-6573 or visit XTO Energy’s command center at the Powhatan Point Volunteer Fire Department at 104 Mellott Street, Powhatan Point, OH 43942. According to a press release, XTO Energy crews have restored electricity to homes that lost power as a result of weekend flooding in Powhatan Point. Now that power is restored, XTO Energy is working with residents in the cleared home to return at their convenience. Four homes remain in the half-mile evacuation zone. The well control team is continuing to clear debris and made progress Tuesday in assessing the wells on the pad to safely stage the area to contain the well. Ohio EPA and XTO Energy will continue to monitor air quality. Any local residents who may have been impacted by this incident are encouraged to call XTO Energy’s claims phone number at 855-351-6573 or visit XTO Energy’s community response command center at the Powhatan Point Volunteer Fire Department, located at 104 Mellott Street, Powhatan Point, OH, 43942. XTO representatives and claims adjusters are on site to assist with the community’s needs. XTO Energy’s well control team has cleared a safe path to the pad and continues to work on clearing debris to stage the area for shutting in the well. On Monday, the evacuation zone was reduced to a half-mile radius of the well pad, with XTO Energy working with state and local agencies to conduct air quality tests at homes and around the perimeter to ensure safe re-entry. Crews are actively working to restore power to residences that lost power as a result of weekend flooding. Five homes remain in the evacuation zone. XTO Energy continues to work with the Ohio EPA to continue monitoring air quality. Any local residents who may have been impacted by this incident are encouraged to call XTO Energy’s claims phone number at 855-351-6573 or visit XTO Energy’s community response command center at the Powhatan Point Volunteer Fire Department, located at 104 Mellott Street, Powhatan Point, OH, 43942. XTO representatives and claims adjusters are on site to assist with the community’s needs. According to XTO officials, the evacuation has been lifted for anyone living outside of a 1/2-mile radius of the gas well pad. If you have not been contacted by XTO Energy officials, you are urged to call (855) 351-6573 to schedule an appointment with a representative to go into your home and conduct a precautionary room-by-room air check. Residents living inside of the 1/2-mile radius are not permitted to return to their homes. Thirty homes remain evacuated as a result of the XTO gas well fire that happened last Thursday in Powhatan Point. Officials with the company say they are working as quickly and safely as possible to get everyone and everything back to normal. After monitoring the air quality along with the Ohio EPA, they are happy to report that they have not found any contaminants in the air. Officials are continuing to monitor the situation, and once they are certain that everything is under control, they plan to conduct air quality testing inside the homes affected. XTO is continuing to reimburse and pay residents for the inconveniences related to the evacuation. If any resident is not returned to their home before school on Tuesday, XTO will arrange transportation to get them to school. Claims adjusters are on site, or can be reached by phone at (855) 351-6573. Experts from CUDD were finally able to get to the well pad on Sunday to remove debris from the explosion. The fire is reportedly out. Stay with 7News for updates. Many of the residents who were evacuated from their homes after an explosion a week ago at the XTO Energy Schnegg well pad near Captina Creek are now permitted to return home, but they are delaying moving back to their homes until the well is capped. When the explosion occurred Feb. 15, close to 100 people were evacuated from 30 homes within a 1-mile radius of the pad. XTO housed them at four hotels in Wheeling, Moundsville and St. Clairsville. XTO spokeswoman Karen Matusic added that the evacuation zone has been reduced from 1 mile around the site to 1/2 mile; that means only four homes that were occupied and one that was unoccupied remain within the mandatory evacuation zone. There still is no timetable for when the inner half-mile radius will be clear for occupation. As of Wednesday evening, there also was no timetable for capping the well. At the moment, crews working on the pad are proceeding with caution as they work to clear the damaged crane away. XTO hired Cudd Energy Services to get control of the leak and cap the well. Matusic said XTO will continue to compensate residents who have been impacted by the accident. 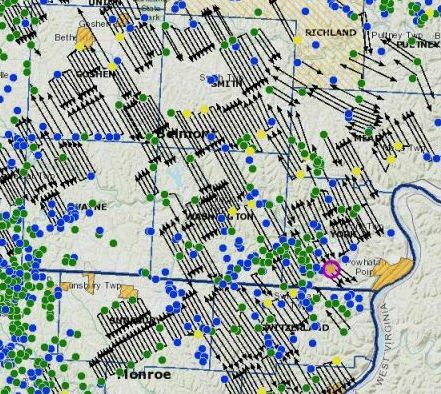 Anyone assessing the cumulative impacts underground? POWHATAN POINT — A break in the weather Sunday allowed a well control team to gain access to a leaking natural gas drilling pad — the first step toward bringing the leak under control. XTO Energy spokeswoman Karen Matusic said the explosion that occurred at the Schnegg pad on Cats Run Road on Thursday created a lot of debris that must be removed in order to create a safe work zone for the well control team. Heavy rain that eventually led to flooding across the region was falling Thursday around the time of the incident. Additional precipitation, including some snowfall over the weekend, slowed efforts to get the well control crew on site. Matusic also said a crane and some trucks that had been on the pad were damaged in the explosion, leaving parts and pieces cluttering the area. She said bulldozers and excavators will be used to remove the debris before work to cap the well begins. Matusic added that the Ohio and U.S. Environmental Protection Agencies and the U.S. Fish & Wildlife Service all have representatives working in the area of the pad. They are monitoring air and water quality around the site and, so far, she said they have not found levels of methane or other contaminants that would be harmful to humans or animals. Does anyone believe XTO (aka Exxon Mobile) or government authorities? Do these levels of methane look safe? She believes these officials are monitoring the water in both Cats Run and nearby Captina Creek. Residents who were evacuated from within a 1-mile radius of the site still are not being permitted to return to their homes. XTO is paying to house those individuals at hotels in Moundsville, Wheeling and St. Clairsville. The families also will be reimbursed for expenses they incur while away from home, such as purchasing toiletries. “We want to get them back in their homes as soon as possible,” Matusic noted. Keep it up, earthquakes are next, ask Oklahoma. In there quick, messy trek to maximize profits before Green Energy put the NatGas people out of business I am sure there are many short cuts being made. I would look at that as a cause of this explosion. That seems to be the ongoing theme in “accidents” like this. “Today the state director of the DNR and Ohio EPA were here visiting operations headquarters and looking at the drone footage,”Matusic said Saturday. … Matusic said XTO will continue to pay for displaced residents’ hotel bills, along with reimbursing them for items, such as toilet paper, that they have had to purchase while away from home. XTO is a subsidiary of global oil giant Exxon Mobil. [Natural gas drilling by Exxon in partnership with Royal Dutch Shell (called NAM), has caused billions in damages to homes in the Netherlands. Courts have ordered the companies to pay up, so far nothing but delay after delay, more court orders, while the earthquakes continue, and get bigger. Did Exxon create XTO so that local people won’t know what brute is driving them from their homes?] 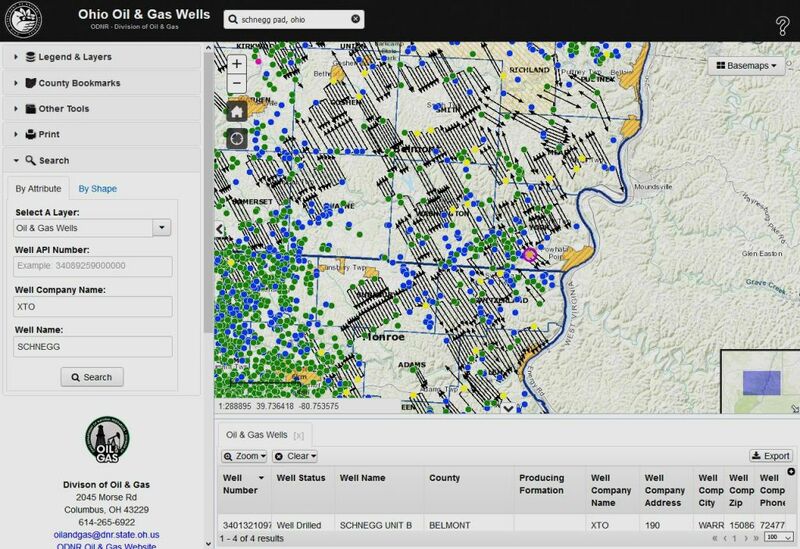 The firm produced natural gas from at least 40 separate wells in Belmont County last year. The company was in the process of fracking a fourth well on the Schnegg pad when the blast occurred.